If you want to get your audience’s attention on Facebook, you know that you need to use video. But, what about Facebook Live? Does it offer the same type of value? Yes! 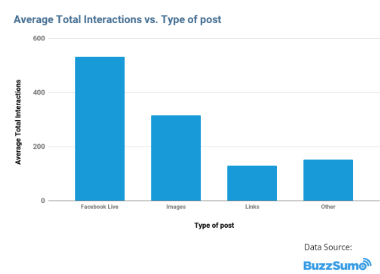 We dug into BuzzSumo’s latest review of 777 million Facebook posts and found that Facebook Live video dominates other post types when it comes to engagement. And Facebook Live’s impact is not limited to sports stars, lifestyle brands, and politicians. The impact of Facebook Live video compared to all other types of social posts. 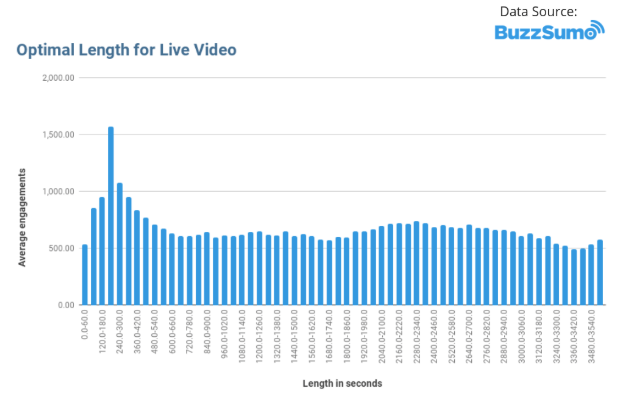 The optimum length for Facebook live posts. 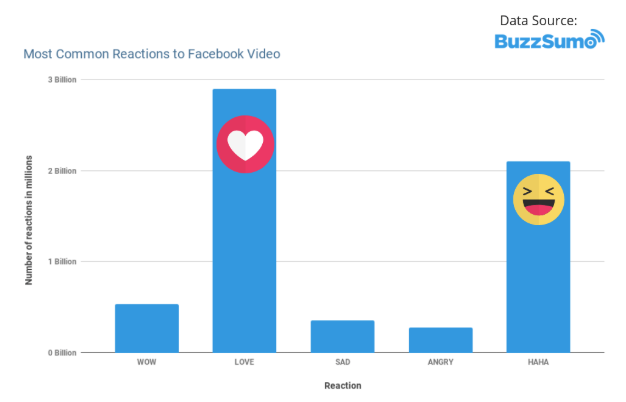 The reactions people have to Facebook video and why we should care. Why B2B and “serious” subject pages should embrace Facebook Live. Quick tips for getting over Facebook Live fears. Facebook Live engagement exceeds all other types of posts by a huge margin! Average interactions for Facebook Live videos this year were 531.11. That’s 68% more than the next highest category — images, with 316 average interactions. If you broaden the research to all types of video, including, but not limited to Facebook LIve, the average interactions were even higher– 538. This year’s data shows that Facebook Live Videos between 1 and 7 minutes long get the most engagement, with the highest averages for Live Videos that are 3 or 4 minutes long. Our sample reflects Facebook posts from Oct. 1 2017 to Oct. 1, 2018. The most recent full year’s data available. As with any tactic, it’s critical to test the length of video that works best to engage your particular audience. You may find better results with longer (or even shorter) Live sessions! If you are just getting started with Live video, start by experimenting with sessions less than 7 minutes long and go from there. Be sure to identify yourself, your brand, and any relevant calls to action early in your Facebook Live presentations. Use Facebook Live to “Edutain” Your Audience. Mari describes “edutain” as the mix of entertaining and educating posts that marketers must embrace to succeed on Facebook. When we approach Facebook with our business hats on, it can be easy to forget that the platform’s users primarily want to interact casually with friends and family members. To engage our audience on Facebook, our messages need to match the network’s vibe. If we post a constant stream of brand-centered content without adapting it to entertain or educate, we will lose our audience’s attention. A carefully crafted sales message that no one sees is not as valuable in the long run as a less-salesy, more entertaining message that people like, share, or comment on. Edutaining messages earn us the chance to deliver more content over time. This gives our audiences a chance to consider our products, compare our offering, and ultimately buy from us. The data highlights the low-key preference of Facebook’s users. The predominant reactions to video this year are Love and HaHa. Consider whether your audience on Facebook would consider any of your posts amusing or loveable. Adjust your strategy to reflect the number of “touches” it will take to convert customers on Facebook. Make sure that your posts are engaging enough to keep your leads’ attention until they have time to learn about and purchase from you. I’ve heard a lot of marketers eliminate Facebook from their plans because the business they represent is B2B. When I saw the data about the predominant reactions to Facebook videos, I was curious to know if companies in more “serious” industries would find less success with live video. I decided to compare engagement over the last 2 years for a subset of topics that I associate most often with the B2B realm. I used the Facebook Analyzer to search for “Technology, Finance, and Marketing,” limiting results to posts with those terms in the headline only. I also did some basic screening to eliminate political and celebrity content. Average engagement across the board for posts in these categories is 76. Average engagement with Facebook Live posts in these categories is 246. That was enough to get a WOW Reaction from me. One reason for the difference in engagement could be the volume of Facebook Live vs. other types of Facebook posts for these topic areas. There are more than 5 million total Facebook posts for these topics, compared to just 26,000 Facebook Live videos. I identify low competition and high interest as an opportunity! B2B marketers should not rule out Facebook, and particularly Facebook Live, until they have tested the platform and format with their own audience. As part of our research, we developed a list of the top 500 Facebook Live videos published in 2018. It’s a fascinating (but hard to classify!) group of posts. (If you are curious, you can take a look at the top 20 here). Because the posts come from such diverse pages–multiple languages, goals, topics, audiences– I decided to go with a set of observations rather than attempt to force conclusions onto the whole set. The top 500 most engaging Facebook Live videos come from all over the world, emphasizing Facebook’s global reach. When thinking about what we can learn from data drawn from Facebook as a whole, it’s important to remember that a worldwide platform can produce monumental data sets. BUT, the most relevant research is into what works with our own audience. If something recommended in a post like this doesn’t work for you, just pivot toward what does. Many of the top posts relate to current events. They are either linked to national or international issues. 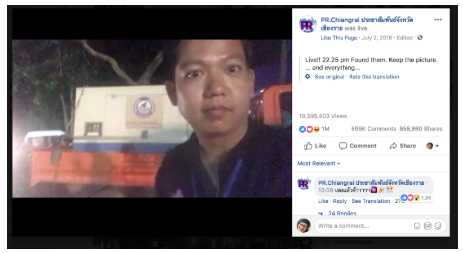 For example, there are many Facebook Live videos in the top 500 that come from coverage of the Thai soccer team that was trapped and successfully rescued from a cave in July 2018. Others offer political commentary for national elections, or coverage of sporting events. Don’t think the emphasis on current events limits the scope for success. Every industry has its own form of current events. There are always industry conferences or research or news that can be covered “Live” on Facebook. Mari’s own Facebook page is a great example, as she offers footage from Facebook and other conferences to her audience. If you are considering Facebook Live this year, consider approaching a journalistic approach for a couple of posts. People love to feel that they are getting an inside scoop. 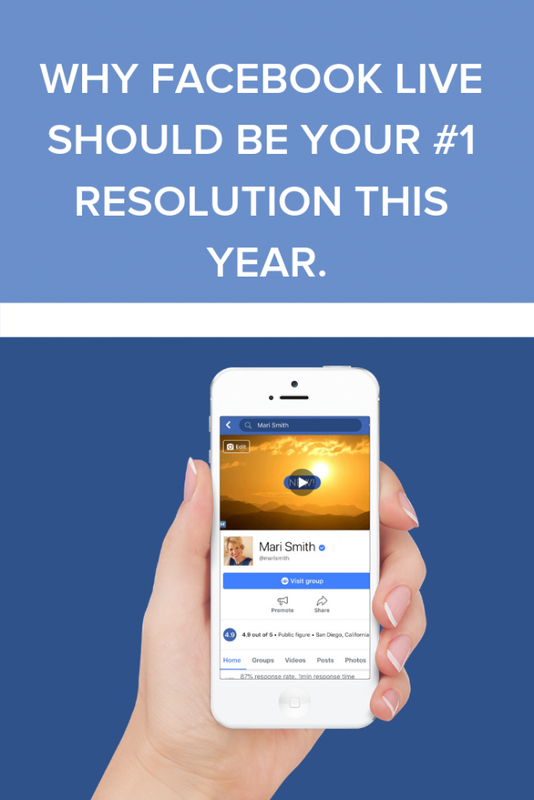 If you are somewhere others in your industry would love to be, invite them in with a Facebook Live video. Humanity seeps out of the seams of these videos. When I think about making a video, I often default to the view that I cannot and should not make a video until I am well-scripted, well-lighted, and well-made up. There’s definitely a place for that level of preparation, BUT these highly engaging live videos don’t appear to be overly produced. They are easy, identifiably LIVE, with sound issues, awkward pauses and awkward camera angles. The sound is also what I would call “raw” with lots of background noise. It has 19+million views and more than 1 million engagements. 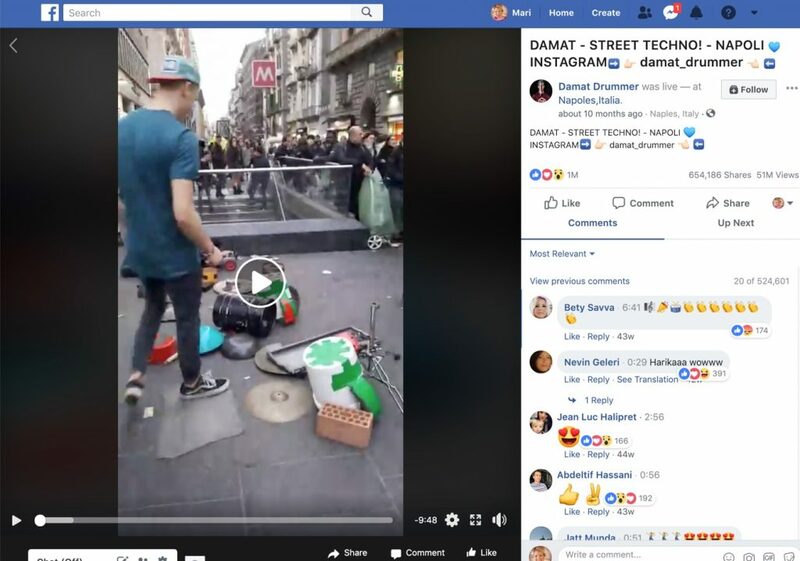 The video runs while the drummer walks to his place and gets settled to play. The reactions from the audience are clear. They paid attention despite the low tech/low editing approach. These top 500 Facebook Live videos were all wildly successful with a minimum of 181,000 interactions. And, many of them have the look of spontaneity rather than intense preparation. Ian Anderson Gray, Live Marketing Coach offers some great advice. “The vast majority of us get nervous before going live! Ian says. “The trick is to learn to channel that nervous energy into your communication with your audience.” The way to do this is by practicing. Start by going live just to yourself on Facebook. Get used to being in front of the camera by playing with Instagram stories. (They are only 15 seconds long and expire after 24 hours.) Do some vocal and physical warm-up exercises before you go live – this makes such a difference. Stephanie Liu of Lights, Camera, Live recommends a private Facebook group as a great place to practice being on camera. Once you’re comfortable with yourself, you can invite a few trusted friends or colleagues to join the group as well. I have followed Ian’s advice to get more comfortable on camera by leaving my webinar software open with the camera running while I work. This has allowed me to be more confident when I’m on camera, allowed me to experiment with camera angles and trained me to look directly into the camera. If you’re ready to go Live but aren’t sure what to say, Stephanie recommends the 10X10 exercise. Take a sheet of paper and fold it in half. On one side write the 10 most frequently asked questions about your product or service. On the other, write the 10 questions people should be asking about your product or service but aren’t. Now, you should have a list of at least 15 – 20 things to talk within your live sessions.